It is 5:40 A.M. I am savoring my first coffee of the morning while checking my e-mail and my growing to-do list. What I really want to do is pull the weeds of my lawn and cut the grass. The dandelions are in full assault mode. 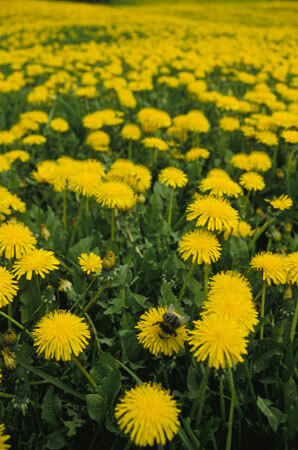 Patches of the unwanted weed are brightening up lawns that just two weeks ago were matted, dull and in hibernation. The annual war on dandelions is on. Now the vibrant greens are being overrun with with the first crop of these tall, gangly weeds with yellow blooms. I suppose, I could go out in the chilly grey dawn and pull a few with my handy dandy dandelion puller. This is a job best suited for evenings, put pulling two jobs, back-to-back is not providing me with enough free "daylight hours" to get at it until the weekend, by which time I figure my lawn will resemble one of my late Aunt Shirley's afghans! I have asked, requested, demanded that Liam and Aidan take responsibility for removing the noxious weed. Suddenly school work has become the top priority. "Dad I have to read", "Dad I have to study" is the refrain. In the meantime, the dandelions aggressively compete with grass for sunlight, water and nutrients.We are doing an all natural treatment My lawn is becoming the victim of neglect. I limed and fertilized. I sowed Kentucky bluegrass seed to fill in bare spots and was waiting for the grass to grow to about three inches high before the first cut. I am just about there, but figure my neighbors would not be happy to be woken at six thirty a.m by the sound of my mower. Do you think 7:30 might be more appropriate? Or is that still too early?I am thinking it is really pushing the bounds of good manners, but it is a working class neighborhood. Early in the morning the grass is all wet from dew, and someone told me it is really bad for your lawn mower to mow it wet. Late afternoons are a better time for everyone involved, if only I could. I can live in hope that when I get home at 10:00 tonight, the dandelions will reduced to a shriveling lump of rubbish on my driveway.